This image portrays elegance and class with a sense of history to it. These timeless beautiful antique ivory baubles look incredibly unique and rare. You could image how delicate these would be to hold and look they are made of fine china porcelain. You almost get the impression these fine baubles are from the North Pole itself. The exquisite pattern looks hand painted on the front of the baubles so they automatically feel hand crafted. 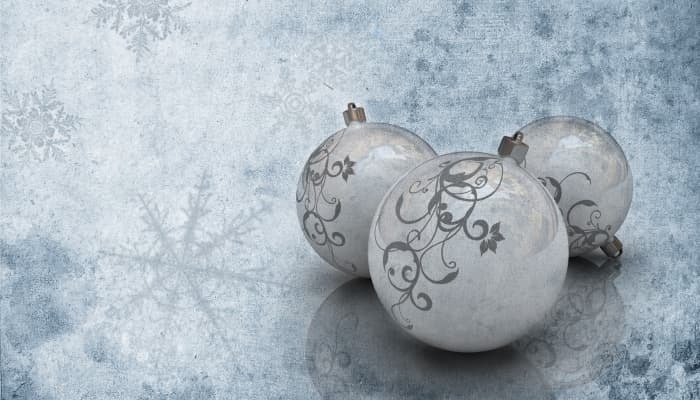 The baubles are delicately placed onto a background of soft white snowflakes. At Ecard Shack, you can create your very own e Christmas cards for business with us this year. All you need to do is follow a few simple steps. The first step is to register an account with us, this will allow you to design and save your ecards. Then you can design as many cards as you like. Alternatively if you have your own image in mind, such as a photograph, you are more than welcome to use this and we can create a bespoke card for you. With Ecard Shack, the options are endless for your electronic Christmas cards for business. If you need any assistance, we are always here to help you no matter how large or small the query. Please don’t hesitate, contact us now!